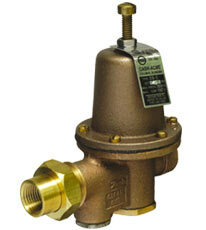 Water pressure regulators reduce a high supply pressure to a lower downstream set maximum pressure. 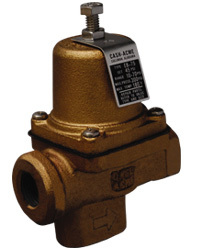 Cash Acme has an extensive range of regulators, from robust high capacity commercial products through compact residential models to economical iron agricultural products. Applications Domestic water supply service. 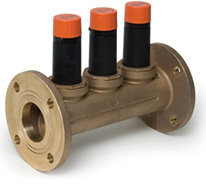 Single Union Sizes 1/2", 3/4", 1", 1-1/4", 1-1/2", 2"
Double Union Sizes 3/4", 1", 1-1/4", 1-1/2", and 2"
Available in lead free*, high working pressure versions (400 inlet psi max) and low pressure set (8–35 psi) models and threaded or sweat. 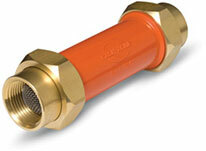 Also available with an inlet blanking cap and contractor kits and protective orange cover for sizes through 1". * Lead free models: The combined surfaces that are in contact with consumable water contain less than 0.25% lead by weight. The SoloSet® EB-25 Stainless Steel features a solid, 100% lead free body, which complies with NSF-61 standards for potable water. The EB-25SS features the exact same cartridge, features, and benefits that are included in the EB-25 pressure regulator. Sizes Threaded & Sweat: 1/2", 3/4", and 1"
Fewer parts for increased reliability. 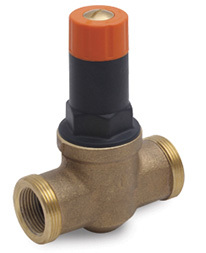 Orange twist-cap enables easy pressure adjustment. 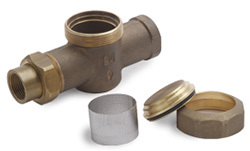 Sizes Threaded or Sweat, with Single or Double Union: 1/2", 3/4", 1", 1-1/4", 1-1/2", and 2"
With Double Barb Ends: 3/4" and 1"
With Double CPVC Ends: 3/4" and 1"
Also available with High Pressure set range 71 to 150 Union inlet/threaded only: 1/2", 3/4", 1", 1-1/2", and 2". Factory set at 45 psi, the pressure may be adjusted to 10-70 psi. Includes a tube with debris screen fittings. Available with Lead Free fittings. Sizes 1/2", 3/4", 1", 1-1/4", 1-1/2", 2", and 2-1/2"
Approvals The EB-5 is certified to ASSE 1003 and CSA B356 and is listed by ASSE, IAPMO, and CSA. Reduces inlet pressure of up to 300 psi down to 45 psi. 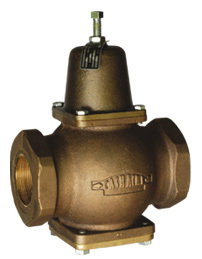 Threaded union inlet and an inbuilt back-pass check valve permits backflow to the inlet side if downstream pressure exceeds the inlet pressure. Applications Domestic installations where small size and economy are important and where codes allow the use of iron body units. Compact iron body and fully pressure-balanced piston. 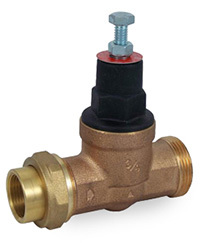 Automatically reduces and regulates high inlet pressures (300 psi max) down to 45 psi at standard factory setting. 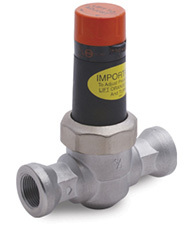 Contains an inbuilt back-pass check which operates independently of the regulator. Applications Commercial and domestic water applications. Sizes 1/2", 3/4", 1", 1-1/4", 1-1/2", and 2"
Approvals The E-3 is certified to ASSE 1003 and is listed by ASSE and IAPMO (UPC). Brass body, threaded connections, stainless steel body seat, BUNA-N diaphragm and seat washer. 300 psi maximum inlet pressure; standard factory setting 45 psi. Large inbuilt stainless strainer with separate clean-out plug. 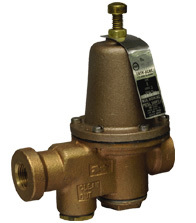 Similar to the E-3 regulator, but without an inbuilt strainer for conditions which do not require their use or where separate, individual strainers are preferred. Maximum inlet pressure is 300 psi; standard factory setting is 45 psi. Low pressure and high pressure models available. Applications Large commercial and industrial water or air service installations. Provides exceptionally high capacity for all services. Bronze body with bronze piston and stainless steel seat ring. Chrome plated spring-opposed, balanced piston design. 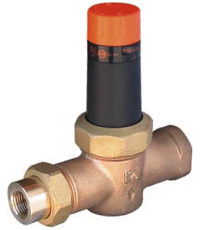 Cartridge style regulators used in domestic water supply service. Domestic water supply service. RVs, dishwashers, washing machines, water meters, water softeners, water fountains, etc.